Kalahari Bushmen are taking the government of Botswana to court over its refusal to allow them access to a water borehole on their land. According to survival international, The case is due to be heard at Botswana’s High Court in Lobatse on 9 June 2010. When the government evicted the Bushmen from the Central Kalahari Game Reserve (CKGR) in 2002, it capped the borehole, the only source of water for the Bushman communities in the Reserve. 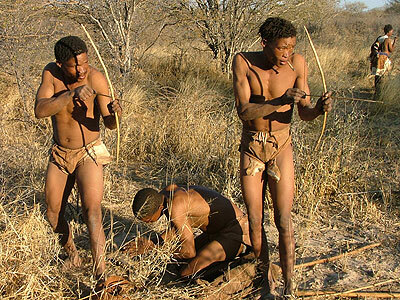 In 2006 Botswana’s High Court ruled that the government had acted unconstitutionally when it evicted the Bushmen and said they had the right to return to the Reserve. Hundreds of Bushmen have since gone back home. Despite the Bushmen’s repeated attempts to negotiate with the government, it still refuses to let them use the water borehole. The Bushmen, who live in one of the world’s driest regions, are forced to make an arduous 300 mile round trip to obtain water outside the reserve. Since the borehole was capped one Bushman has died of dehydration. In desperation the Bushmen are going to court to assert their basic human right to water. The UN’s top official on indigenous rights, Professor James Anaya, has also condemned the government for its treatment of the Bushmen, stating that it falls short of the ‘relevant international human rights standards’. He found that Bushmen in the reserve ‘face harsh and dangerous conditions due to a lack of access to water’, and called on the government to reactivate the borehole ‘as a matter of urgent priority’.